Understanding the scale of the issues and the urgency for action. There is a growing body of information and data on the links between pollution and health and this demonstrates more and more strongly the scale of the impacts of contaminated sites. The numbers of people affected worldwide are now estimated to be of the order of 200 million, as set out in the key summary on the Poisoned Poor, showing why urgent action is needed in many countries. Key decision makers at national and international level need to be aware of the scale of this global threat. There is now a growing amount of scientific literature on the scale and impacts of the problems, including work supported by GAHP. Key papers are included here. Think you’re not impacted by polluted places far from your home? Our new report: Pollution Knows No Borders shows how toxic pollution travels from country to country, not only in the air and water, but also in the food and products we buy. We are all affected. We are all connected. Our children are the most vulnerable victims. Learn more about why this is one of the biggest health threats and what we can all do. 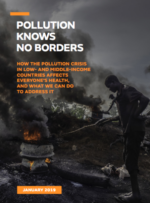 This updated fact sheet lays out the most recent data on the impact of pollution on health in low- and middle-income countries and specifically lays out the leading causes of death and the portion of the mortality caused by pollution. The Poisoned Poor documents, prepared by the GAHP, summarizes key issues about the people most affected by toxic pollution. Toxic chemicals from industry and mining affect the health of hundreds of millions of people in low- and middle-income countries. Heavy metals, pesticides, solvents, radionuclides and other toxic substances can be found at dangerous levels at thousands of sites around the world, in drinking water, soil, air, and food. These chemicals (lead, mercury, chromium, and cadmium, etc.) affect local populations in the poorest towns and neighborhoods, especially children. A recent study of more than 3,000 toxic sites, funded by the World Bank, European Commission and Asian Development Bank, shows that as many as 200 million people may be affected. A detailed analysis of 373 contaminated sites in India, Indonesia and the Philippines calculated that the amount of disease caused by toxic exposures was similar to that of malaria or outdoor air pollution in those three countries. The impact of these diseases, and the commensurate loss in economic capacity, is enormous. A summary of global deaths from pollution. Pollution is a much bigger problem than HIV, malaria, or TB. One in seven deaths in LMICs are caused by pollution. The purpose of the WHO Manual for the Public Health Management of Chemical Incidents is to provide a comprehensive overview of the principles and roles of public health in the management of chemical incidents and emergencies. Summarizes scientific evidence and provides risk management recommendations for the 10 chemicals or groups of chemicals of major public health concern. Health Impact Assessment (HIA) is a means of assessing the health impacts of policies, plans and projects in diverse economic sectors using quantitative, qualitative and participatory techniques. HIA helps decision-makers make choices about alternatives and improvements to prevent disease/injury and to actively promote health. The WHO Human Health Risk Assessment Toolkit: Chemical Hazards provides users with guidance to identify, acquire and use the information needed to assess chemical hazards, exposures and the corresponding health risks in their given health risk assessment contexts at local and/or national levels. Summary of the issue prepared for the European Commission in Brussels. A summary of the issue and potential solutions. Diseases caused by pollution increase health care costs, especially for high-cost NCDs. They impose an unnecessary load on health care delivery systems by increasing hospital staffing needs and thus diverting resources from essential prevention programmes such as childhood immunizations, infection control and maternal and child health. They undermine the development of poor countries by reducing the health, intelligence and economic productivity of entire generations. Pollution is highly preventable and pollution prevention is highly cost-effective. Yet despite their high economic and human costs and amenability to prevention, the diseases caused by pollution have not received the attention that they deserve in policy planning or in the international development agenda. Given the great impact of pollution on health and health care resources and the high cost-benefit ratio of pollution prevention, efforts to mitigate pollution should become a key strategic priority for international funders and for governments of LMICs. Assisting LMICs to prioritize disease prevention through the management of pollution is a highly cost-effective strategy for enhancing population health, reducing the burden on limited health resources and advancing national development. This year’s report, Top Ten Countries Turning the Corner on Toxic Pollution- 2014, tells the remarkable stories of 10 successful cleanup projects that are saving lives, improving community health and restoring the environment. From Vietnam to Kyrgyzstan to Senegal, the success of these projects was the result of unique partnerships and creative solutions.